Reboot to restore software preserves admin-defined system configurations so that students can access computers safely and securely. In educational institutes, providing students with unrestricted access to computers and internet while maintaining system integrity is the biggest challenge for IT admins. Reboot to Restore technology makes computers virtually indestructible by preserving the admin-defined system configuration. Computer labs are a common sight in both schools and colleges. Workstations within the labs are used by various students on their specific line of study or interest. System performance is affected often owing to constant use by students and staff members alike. Access to web resources, frequent download of files and add-ons, redundant applications, and so on, paves the way for configuration drifts and virus infiltration and can cause systems to malfunction if issues are not fixed on time. One can imagine the mounting number of IT support tickets in an educational institution comprising 500 -1000 students. The IT team faces challenges in reducing the complaint-service gap, especially due to the shortage of staff. IT Personnel has no other way but to physically visit every system to address issues. Identifying specific issues and troubleshooting systems accordingly consume a significant amount of time and effort leading to prolonged downtime and hindering classroom activities. Lack of proactive endpoint maintenance prevents educational institutes from deriving the expected benefit out of the investment made on technology. Students and teachers are stuck due to technical glitches and need to wait for tech admins to turn up. Such delays prove to be an absolute obstacle at the time of demonstrating presentations, training sessions, assessment exams, and the like. 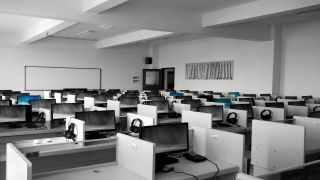 The IT teams at educational institutes need a solution that can protect all types of on-campus computers without hindering the learning experience of students. In fact, the right technology should also enable teachers and management staff to perform their respective duties more efficiently. The reboot to restore technology was innovated to cater to such requirements. Its instant system restoration capabilities preserve the admin-defined state and make it easy for the users to resolve system issues on their own. The Reboot to Restore technology functions by shielding the system configuration from unwanted changes. The technology allows users to work on the device as usual without any admin-imposed restrictions. However, the changes that users make during a session (or the automatic inputs such as cookies) are not permanently written on the hard disk. When the device is restarted, the Reboot to Restore technology discards all the inputs from the previous session and reloads the configuration initially set by the admin. Hence, a user can simply reboot and restore the clean system state instantly. The technology effectively removes malware, unwanted applications, files, software updates, cookies, and similar system inputs. Unbreachable System Protection: Reboot to Restore technology permanently secures the desired configuration and effectively removes all user session data upon a reboot. Hence, both online and offline threats (harmful or otherwise) have zero effect on the configuration whatsoever. Even if any kind of malicious programs or junk files enters into the system, they will be discarded once the device is rebooted. As a result, the configuration defined by IT admins remains intact unless modified by an authorized user. Unrestricted Resource Accessibility: The Reboot to Restore technology can effectively revert all the unwanted system changes upon every restart. This allows IT admins to provide unrestricted access to both online and offline resources to users. It paves the way for users like students to carry out research related activities without any obstruction. On the other hand, if a virus or malware is accidentally downloaded, the problem can be addressed easily. Upon every restart, the optimal state of the device is restored. Improved Staff Efficiency: By restoring the clean configuration on system restart, the Reboot to Restore technology ensures that the devices are available for both students and teachers in the top-performing state. This naturally improves teaching efficiency and boosts students’ productivity. IT Budget Optimization: The instant and repeated restoration capability offered by the Reboot to Restore technology addresses most of the system maintenance concerns, that otherwise keep the IT team on their toes. IT admins need no additional software or applications to resolve system-related issues, thus bringing down IT costs. Even a small IT team can manage endpoints throughout the campus as the technology is reasonably simple to deploy and manage. Reboot to Restore software tools have been a popular choice for IT admins managing multi-user computing environments. The software secures the system configuration the moment it is installed and enabled on a device. A feature-rich Reboot to Restore software comes with robust features like central management for complimenting the core restoration functionality. For instance, the Enterprise Management Console feature allows the IT staff to deploy, configure, and manage the software on all endpoints from a centralized system. Configuring partitions to allow saving of session inputs while the software is enabled are few other cutting-edge features. As a Windows SteadyState alternative, these tools support automating OS updates using scheduled maintenance task feature which automatically manages updates to download and install once configured. It cannot be denied that maintaining the desired clean configuration of systems in multi-user environments such as schools and colleges is no easy feat. Solutions leveraging the Reboot to Restore technology simplify an admin’s task through instant system restoration and extended management features. Deploying such a computer restore software ensures that devices are always up and running at their optimal state.